When hubby and I arrived in Chinle, AZ, which is at the entrance to Canyon de Chelly this summer, it was during the monsoon season. The clouds were very active that afternoon. I've already posted the double rainbow that we saw this same afternoon, but this sunburst was also amazing! It is so clear up there, the air is so fresh! We love visiting Canyon de Chelly. This summer, with all the monsoon rains, the Navajo ponies were fat and well fed. There was standing water on the ground. It was a wonderful trip! Doesn't the large, dark cloud look like cotton? Please visit Skywatch for other amazing photos! Love it, great capture. thanks for sharing! Wonderful photo. That cloud looks so heavy and full with water. Yes, it really looks like cotton! very dramatic clouds...they make for a great photo. Happy SWF. I love the Canyon de Chelly! 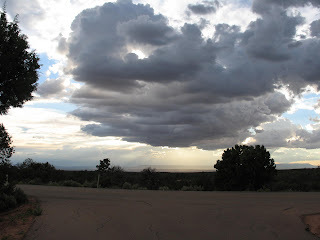 This is a great photo of the sky over Chinle. I wonder why that cloud doesn't fall down under it's own weight!